Do you have an amazing website, add content frequently but are receiving little to no traffic? Or does the following sound familiar? You have spent weeks working on a professional website design for your business, or you have paid a website designer to make the website of your dreams, but you see no traction in the search engines, resulting in no traffic, leads or customers. I assume all readers of this blog are quite aware of point one above (Technical SEO). If you are uncertain about your technical SEO and need an SEO Audit, you can check my Malta-based SEO service, where we would be more than happy to help. Let’s also assume that you are adding content to your website on a regular basis (two to four times per month). It must not be ordinary content but high-quality content that is based on keyword phrases your target audience is using when searching for goods or services you provide. You must also ensure that the content you produce is of better quality than currently exists on page 1 of Google search results. These processes are the fundamental blocks of point two above (On-Page SEO). So this article is going to concentrate on point 3, Off Page SEO, which is often sadly neglected by website owners. Why you ask? Well, because it can be overwhelming to know what to do, it can take months before you see the positive effects and most of all because it is often very tedious work! When you have a new site, the main goal is to increase your level of authority and trust by building up a network of referral assets all driving traffic back to your website. You can achieve this by utilising online platforms and third-party websites to promote your content, products, services and even your own personal brand. In the SEO world, this is referred to as Off Page SEO or backlink building. The beauty of the backlinking strategies listed below not only drive traffic from these off page web portals and websites, but you increase your page rankings in the Google Search Engine as Google counts backlinks as one of their top three ranking factors in their ranking algorithm (content and Rankbrain algorithm being the other two). 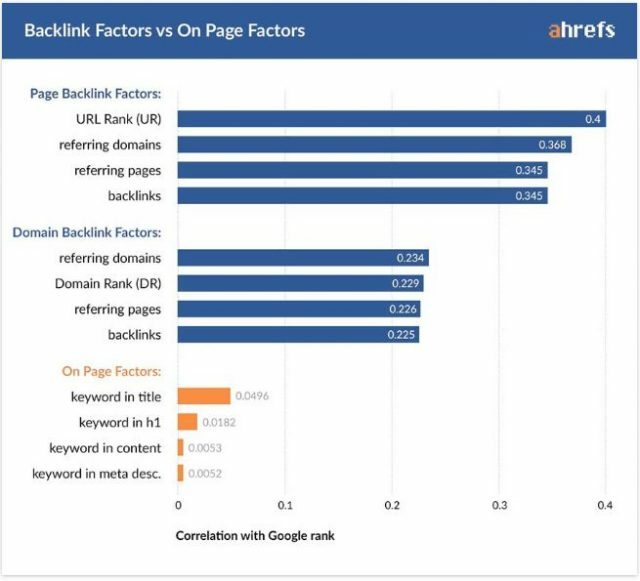 According to ahrefs study, backlink building is more effective than On-page SEO. Backlinks force your way onto page one, while On-page SEO determines where you rank on Page one. Now, this does not mean you cannot rank on Google Page One without backlinks as it all depends on the level of competition for the keyword phrases you are trying to target. However, for more popular searches with mid to high level competition, you will need to attain backlinks to get those higher Google rankings. Be warned though, not all backlinks are the same. Google’s algorithm (Penguin update) ensured that only high-quality backlinks are counted towards your rankings, therefore forget trying to buy cheap backlinks on marketplaces like Fiverr or Warrior Forum as you will do more harm than good to your site. Unnatural backlinking as provided by the services on these websites will land you a Google penalty. What Backlinks Should You Be Building? There are the four different forms of Off Page SEO you should be building to grow your online brand and drive consistent traffic to your website, which if done correctly will increase month after month. You should secure your brand name on all the major social networks. This will build your domain and brand authority as Google trusts these networks. Spend some time personalising your profile pages, add your logos and pictures of your office, products, opening hours, areas of expertise, fun facts etc. Also add a link back your website and link to your other social network accounts which pass valuable link juice between your link properties and back to your site, offering additional SEO value. Once you secure your brand name across all the major sites and personalised your profile pages (there are over 40 essential social networks you should set up), set up automation using services like IFTTT or Jetpack plugin to syndicate your latest blog posts. This takes time to set up at first, but it’s a one and done type task, and it will create links and drive traffic to your website, everytime you publish a post on your blog. The next type of backlink to build is called hustle backlinks as they are required at the very initial stage of setting up a website. Your new site will have very little domain authority in the eyes of Google at this point. Therefore, you will see very little search engine traffic, so you need to self-promote to build your brand and get the initial traffic moving! This type of hustle backlinking involves building your online network in communities, forums and websites where your ideal customer is already hanging out. In these type of online communities, you cannot just register and start promoting your business off the bat as this is seen as spam. You will get barred and ruin your reputation before you even begin. You must add value to the community by helping others using your knowledge and expertise. You can then drop links back to useful content on your website when it makes sense. This will naturally drive referral traffic back to your site as well as build your brand authority. Every niche imaginable has their online communities. And if you cannot find one exactly, there are always geo communities which offer more broad subject matter but still useful to drive traffic to your website. A great way to ensure you get the maximum ROI from your content is to repurpose it so that you can syndicate on other well known and highly trafficked websites to drive potential customers back to your site. You can also input these media types into your content which increases user engagement metrics (which is also a ranking factor with google) and also makes your content stand out more from your competitors. When you add your repurposed media to these websites, you can also post a link back to your post page, which gives you additional SEO benefit. This is a safe in the eyes of Google as the links are coming from trusted websites such as Youtube.com, Dailymotion.com, soundcloud.com, slideshare.net, visual.ly etc. An editorial backlink is where the owner/editor of a website or blog places a link to your site within the content or body of an article/post on their website. These are exceptionally high-quality backlinks that can drive lots of referral traffic to your website (dependant on the domain authority of the site). However, the even bigger bonus with these editorial links is the boost in your google search engine rankings. Find blogs in your niche that accept blog posts and pitch the editor topic ideas that you think would suit their audience. The more research you do on your target guest post website, the higher the chance that they will allow you to submit a guest post. This strategy aims to create a high-quality resource page or resource centre on your website that is worthy of someone adding this page to their resource page. Use email outreach to ask these blog owners to include a link back to your resource page. This is also called a Guestographic, and it is quite simple to execute. Find a content topic relevant to your niche or complementary niche that has already proven to receive a lot of backlinks. Make a visually compelling infographic of this content topic and add some extra points to make it even better than the original content piece. You then outreach to websites who have already linked to the old article or similar content pieces and ask if they would like to see your infographic. You will find that some website owners will either add it to their existing page, or they will create a new blog post on your infographic. You can offer to write the introduction where you include a link back to your website. If the website owner responds but is not interested in the infographic, try discussing if they are willing to accept a guest post instead and put forward some topic ideas. Some websites frequently publish roundup posts or best of the web type posts. Do your research on the types of content they like to include and outreach to them when you have published a high-quality article and look for inclusion. This can be quite labour intensive, therefore, using automated tools such as scrapebox is highly recommended. Make a list of websites from where you would like a link. Then you must scrape all the pages of your target website and scan each page for a broken backlink. If you have a piece of content that is similar in topic to the content of the broken backlink, send a mail to the webmaster and informing him of the broken backlink and advising that you have a link that could be used instead. Of course, if you do not have a similar piece of content, you can always use archive.org to see what content was on the broken backlink page and make a better version of it, then proceed to email the webmaster as before. Every business uses suppliers, services or tools/products to perform their daily work. Each one of these entities also has their website. Reach out to your favourite suppliers, service providers or tool/product owners and ask if they would like to add a testimonial on their website from you, as long as they will place a link back to your site. As testimonials are great for boosting conversions, it is a win-win situation for both parties. This is very similar to the guestographic strategy, but instead of making an infographic using data points from a piece of content that has previously received backlinks, the aim is to create a better version of the written article. So if an original content piece were 2000 words, the new content piece would be 4000 words or updated relevant content and also contain additional media such as slick images, better formatting, custom videos etc. The article should be head and shoulders better than the original piece and justify the “epic” tag. Like the guestographic strategy, you then outreach to everyone who has shared the original post before or websites who have shared something similar before asking to replace the link/include it on their site. This is quite an often overlooked strategy but such a simple one. Every person knows at least a handful of people who own a website or blog. While it may not be as highly relevant as one would want, it still counts. Ask your friends if you can write a guest post on their site in return for some free work or a few beers. If they are your real friends, they will happily oblige with no strings attached! This is a great way to get on the radar of influencers in your niche. Not only do you build meaningful relationships but you also get to produce an outstanding piece of content. Send a niche related question to prominent bloggers in your industry asking for their expert opinion. Once you have compiled all the answers and added your input with regards to the topic’s subject matter, send an email to the experts letting them know about it. A high percentage of the experts will share the post on their social media accounts, leading to a massive inrush of traffic. Some of the experts may even link to the article on their website, gaining you a high authority backlink for your troubles. Make a list of complementary niches to yours and then put together a “best of” list, including all the leading players in that sphere. Like the previous strategy, once the article is published, promote it to all the included influencers via email and social media. Expect a lot of traffic if the article is well presented and the outreach emails are authentic and genuine. Paul Redfern is the founder of FixNowMedia and regularly works in partnership with ZigPress when specialist SEO knowledge is required on a particular project.